Britain Faces Closing The Book On Libraries About 400 libraries have been targeted for closure, sparking an outcry from communities across the country. Local officials say it's among the toughest decisions they've had to face. From across Britain Thursday came a cry for help. Nearly 100 local officials wrote a letter to the Times of London saying the government's austerity measures are too hard to swallow, and they are being forced to cut critical services. Stony Stratford Library, in a small town near Milton Keynes, may be closing. Last month, customers checked out all 16,000 books as a protest against the proposed closure. Among the toughest decisions the local politicians face is whether to shut down their public libraries. About 400 or so have been targeted for closure already ... sparking an outcry from communities across the country. There was a time in Britain, say 160 years ago, when some in Parliament didn't believe in public libraries at all. The worry was, if the working class read books, it would get dangerous ideas and rise up against the government. That's not the debate today. But this is still sensitive ground for politicians. Prime Minister David Cameron stressed that his government is happy to invest in libraries, if they evolve. "We all know a truth about libraries, which is those that will succeed are the ones when they wake up to the world of new technology, of the Internet and everything else, and investment goes in. That is what needs to happen," he said. The leader of the opposition Labour Party, Ed Miliband, was quick to respond: "Only this prime minister could blame the libraries for closing." One of the libraries slated to be closed is in a picturesque little town northwest of London called Stony Stratford. The library is right in the heart of town, on a street with brick homes and little shops. If you lay off your staff and sell off your library buildings, then when the good times come, you have nothing. Sarah Richardson was on her way to return a bag of books. But for her, this was not just any bag of books. It was her small part in a public uprising. The residents of Stony Stratford organized last month and, together, checked out all 16,000 books from the library. 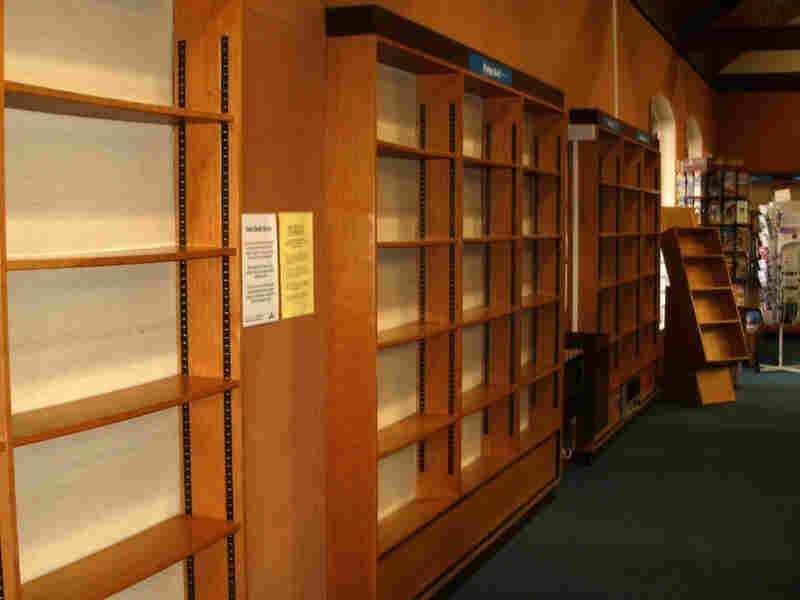 The bare shelves, they hoped, would send a message that the place had to stay. Richardson, a single mom, says she relies on the library's free computers. There's no Internet at home. "We did have [it], and then me and my husband split up, so the computer went," she says. Officials in Milton Keynes, the region that includes Stony Stratford, will make their decision about the library on Feb. 22. A spokesman for the regional council said deep cuts in funding from London have put "unprecedented pressures" on elected officials, forcing painful decisions. Still, among all the austerity measures being proposed, this one seems to have generated the most widespread emotion. Lauren Smith is helping to run a national campaign called Voices for the Library. 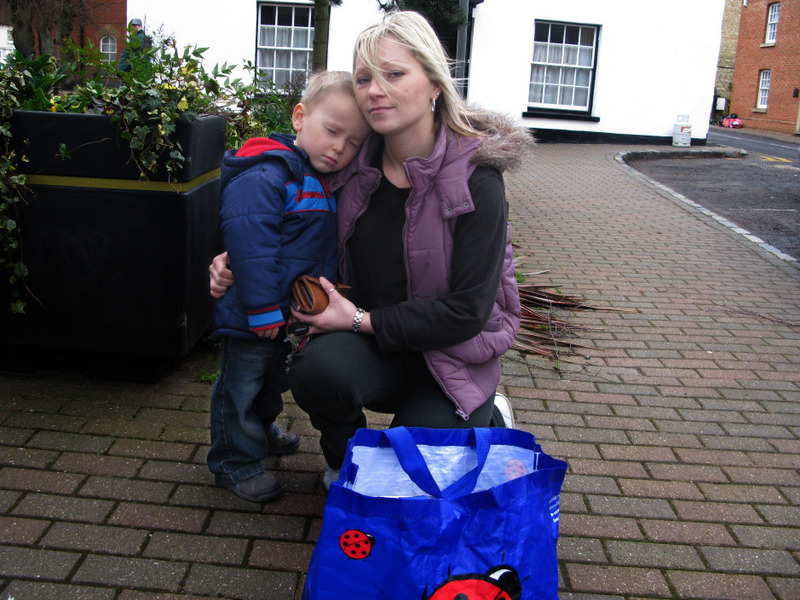 Sarah Richardson and her son, Harry, return a bag of books to the Stony Stratford Library. She took out the books as part of a protest against the possible closure of the library. This is the message she says she hears from people: " 'I've never, ever campaigned against anything before; I've never gone out with placards; I've never marched; but do you know what — this, this is important, and this is what we need to stand up against, because this can't happen.' "
Smith said politicians in London don't appreciate the role libraries play — as gathering spots for young children to read ... "all the way to a 93-year-old lady whose husband had died, she only spoke to one person on a Tuesday, when she went to the library, and that was the person in the library branch, behind the counter." All is not lost if a library closes — that's Roy Clare's message. As CEO of Britain's Museums, Libraries and Archives Council, he's been advising local officials. Sometimes, he says, closing a library can make economic sense. Especially when there are good alternatives — like reopening as part of a local museum. "And it's really important that we don't end up with museums and libraries and other forms of center, all behaving as though they're utterly independent and different," he says. "From a public point of view, they're often good places to go, to browse, to be, to learn, to get information. … Well, why not put them together?" The people out fighting for the libraries are open to options like that. In the meantime, though, they're determined to protect every last library they can. One of the biggest demonstrations was last weekend when an army of authors hit the road, including a writer of children's books, John Dougherty. As he drove the rolling Cotswold hills of southwest England, Dougherty said he just wants people to realize the permanence of decisions like this. "If you lay off your staff and sell off your library buildings, then when the good times come, you have nothing," he says.